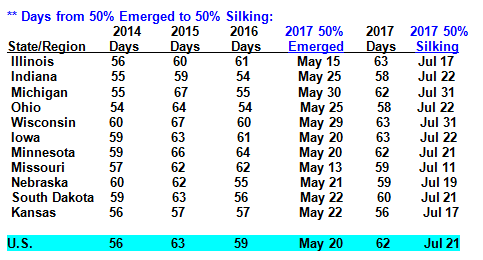 Since the end of winter, the US weather pattern has, if nothing else, been rather volatile. This is expected to continue and we caution against committing to a longer term trend, whether it be hot/dry, cool/wet or some other combination. 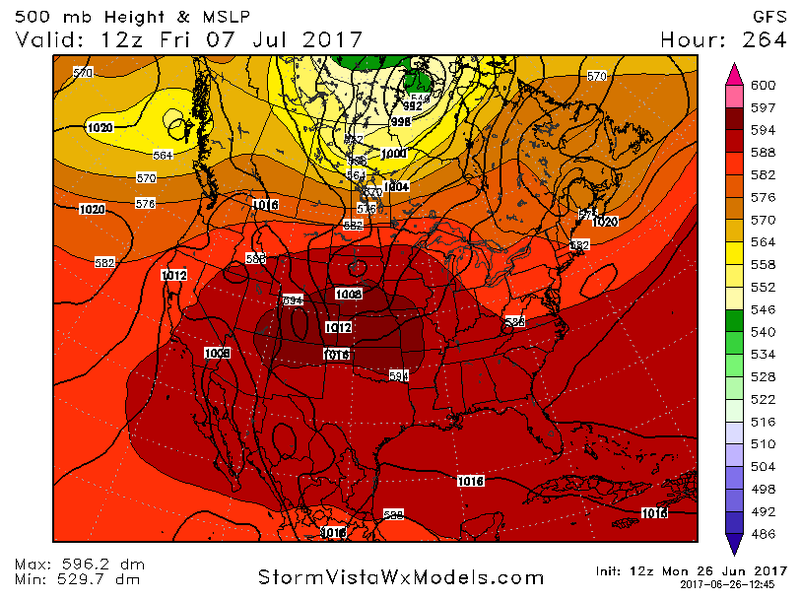 The graphic above displays the upper air pattern on July 7th, and the major forecasting models so far this week are in general agreement that that a high pressure Ridge (deep red in graphic) will expand to envelop much of the Corn Belt in early July. Ridges, of course, trigger hot and dry conditions, and depending on the intensity of the Ridge, this pattern can last several weeks. That this Ridge has re-appeared in the forecast is a testament to this year’s weather volatility, and we expect additional bouts of heat and dryness to appear between now and late August, particularly across the Central Plains. The primary issue is the relative lack of soil moisture, which can feed heat and dryness via a sort of snowball effect. Our work suggests the bulk of corn pollination will occur just after the middle of July, and despite recent cool and, in some places, very wet weather, the market is a long way from knowing whether national US corn yield will be above or below trend. Expect a bumpy ride, but without confirmation of above-normal precip, the most probable US corn yield in 2017 rests between 165-168 bushels/acre, and as such another test of $4.00, basis December, lies ahead.